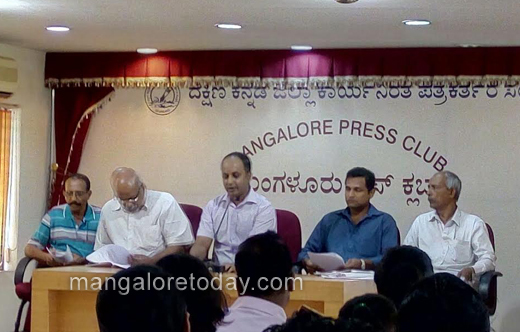 Mangaluru, June 28,2017: Reports of the press meet at Press club on June 27, Tuesday brings to light that Citizens group consisting of a ward committee of civic groups and RTI activists plans to file a PIL- public interest litigation in the High Court of Karnataka over the inordinate delay in the formation of ward committees under MCC - Mangaluru City Corporation. Addresisng the media representatives present, Nigel Albuquerque on behalf of the group said that legal notices have been issued to the chief secretary to government, director of municipal administration, Dakshina Kannada deputy commissioner and MCC commissioner, seeking formation of ward committees within 15 days from the date of receipt of notice. The ward committees had not been formed in 60 wards of Mangaluru as stipulated under Section 13H of Karnataka Municipalities Act, 1976, for a long while inspite of petitions made by public of Mangaluru. The notice also is reported to have stated that like-minded people will move the High Court with a PIL challenging the legality, validity and regularity of creation of council committee to explore the pros and cons of the ward committees. He added that they may please to seek dissolution of the council for having failed to comply with the Constitutional provisions and the KMC Act, 1976. Appeals to the Prime Minister, Union Minister Venkaiah Naidu, Secretary to Ministry of Urban Development, Sajeesh Kumar N, Director Smart Cities Mission, Chairman and MD of Mangaluru Smart City to form ward committees had been forwarded. It was pointed out that formation of ward committees has been mandated by Article 243S of Indian Constitution as well. The Union government has been urged to make formation of ward committees a prerequisite condition for granting of funds under the Smart Cities Mission, throughout the country. The ward committees will ensure the effective redressal of the problem of solid waste management faced by the cities. In the absence of ward committees, cities like Mangaluru which are selected under the Smart Cities Mission may not be able to effectively implement the objectives of Smart Cities Mission, he felt. He went on to say that high court had directed the Bruhat Bengaluru Mahanagara Palike to constitute ward committees soon. The BBMP has so far constituted such committees in 68 wards. "We will watch the BBMP move as well. If the BBMP can implement it, why can’t Mangaluru City Corporation?" he questioned. Further, Ullal Padmanabha who waspresent, has been fighting for the cause of ward committees, said that following his petition, the Directorate of Municipal Administration had issued a circular dated February 18, 2017, to all the corporations asking them form ward committees and hold ward meetings. The council meeting of Mangaluru City Corporation in June 1997 had discussed on forming ward committees and had constituted a council committee to explore of pros and cons of ward committees. Even in October 2014, when the issue was tabled, a council committee under the chairmanship of senior corporator Lancelot Pinto was constituted. Though the Council has been constituting Council Committee, no report has been submitted to the MCC so far, he said.